Aloha! Welcome to one of the best new 4 in 1 combos that is sure to delight in so many ways. Prepare for a tropical journey to fun land! The best of both worlds, this Aloha combo is a winner whether you want it wet or dry. If you want the wet 4 in 1 you get a bouncer and a water course as with the pool attached kids can bounce, climb up the ladder and push off onto the sliding lane whipping around a 90° turn and splashing down into the pool. 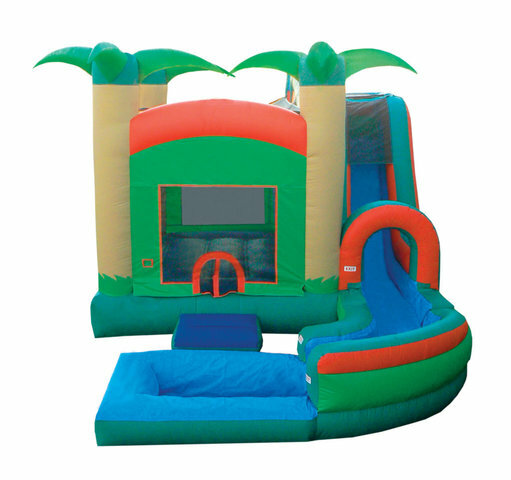 This innovative Jump N Splash specialty has a beautiful tropical theme and our special heavy duty non-slip material on the entrance ramp and on the entire jumping mattress, virtually preventing kids from slipping. The 15 L X 10 W bouncer that comes with the Aloha 4 in 1 has a basketball hoop.